The Last Frontier, which can be viewed above or in two parts. The first part focuses on the links between the construction of dams in Sarawak and Hydro Tasmania. View part one HERE. The second half shows the clear connections between the logging of high conservation value forest in Tasmania and the logging industry in Sarawak. View part two HERE. The thing that I found most powerful about this video is the incredible interviews that journalist David O’Shea conducted with the Indigenous people in Sarawak, outlining their ongoing resistance to the logging and dam construction. These industries in Sarawak are destroying the very land that Indigenous people rely on for survival. The displacement of their communities, with absolute disregard to their livelihoods, community and culture is an atrocity committed for the sake of the money-making of a few at the top of Sarawak’s corruption. Watching this video I was overwhelmed and inspired by the spirit of survival and resistance of the people in Sarawak speaking out about the dams and the logging. I hope that through this media exposure more people around the world will support their struggle for their rights and their land. This great piece of investigative journalist has clearly exposed the links between Tasmania and Sarawak. One link is with the government business enterprise Hydro Tasmania. This organisation was once at the centre of the controversy over the flooding of Lake Pedder and then the controversial Franklin Dam – which was defeated by one of Tasmania’s most significant environmental protest movements. Now the company are embedded a relationship with the powers that be in Sarawak, giving advice on dam projects that will flood the homelands of Indigenous people in Sarawak. Ta Ann is also exposed in this news piece, which shows clearly company’s role in the destruction of forests in Sarawak and their practises here in Tasmania are. Film still from the Dateline story. Jenny Weber, campaigner from the Huon Valley Environment Center recently featured here on observertree.org with a video blog message. Jenny has worked tirelessly to expose the role of Ta Ann in the clearfelling of high conservation value forests in Tasmania and the ongoing misrepresentation of these products on the international market as “eco” products. Jenny’s comments and those of Former Senator Bob Brown are a strong reminder of the implications that Ta Ann’s practises have for Tasmania and the world . If you have watched the story, and are feeling understandably angry at what is happening in Tasmania and Sarawak, please take a moment to do something about it. Click HERE to send a message to the corporate customers of Ta Ann and let them know what is going on. 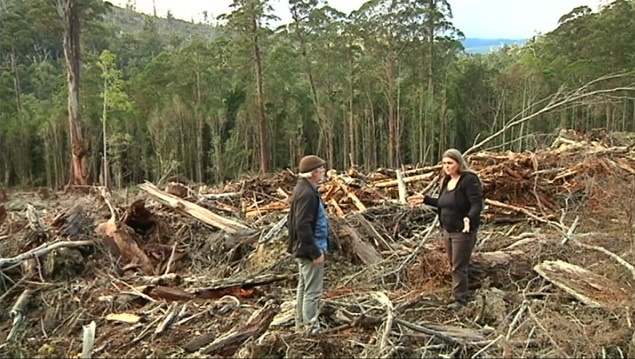 The other great news story was the feature on Tasmania’s forests on Italy’s prime time TV nature show Missione Natura. Over three and half thousand people from Italy have already visited observertree.org since the story went to air. It’s great to be getting international exposure for the forests. And from the international media right down to the classrooms of local schools, the important message of forest protection is making a difference. This week I have had some inspiring Skype talks with school groups. Including an enthusiastic grade four class. A group of young students contacted me to ask me questions about what I am doing and why. They had spent lots of time researching about the forests and Tasmanian devils and had plenty of interesting questions. So, the students organised with their whole class to talk with me over Skype. It was inspiring to see so many young people who really care about the forests and the future of our environment. One question the students asked me is: how can we help? A great thing that people can do to help is to spread the word across the world: tell your friends and family, share this site on your social media networks., share it far and wide! The more people who find out what is going on and who help take action for these forests, the sooner we will be to seeing high conservation value forests in Tasmania protected. And the more we can increase the international attention on what is happening in Sarawak and support the Indigenous people to resist the destruction of their homelands. Please take action HERE now. Posted on August 23, 2012, in Daily Blog, News Articles, Videos. Bookmark the permalink. 4 Comments. The Dateline exposé on Wednesday left me feeling very angry at the undemanding relationship between Ta Ann and the Tasmanian Government. The fact that ex-FT boss, Evan Rolley is manipulating the situation from within the Ta Ann ranks, and blatantly lying about the timbers being harvested by FT for Ta Ann, incenses me. Now there’s a ‘wolf in sheep’s clothing’! The very direct line of questioning by David O’Shea and commentary by Claire Rewcastle Brown left both Ta Ann and the Tasmanian Govt looking culpable. How convenient for our government – we’ll give you our best timbers (you can call them – umm – Eco wood – yeah that’s it! ), and you can let us in on the dam project – It doesn’t matter if tens of thousands of Sarawakians will be displaced – they’ll be better off! Great stuff though, with Missione Natura and the junior schools skyping The ObserverTree. Excellent! The days are beginning to draw out now, Miranda, and its T-shirt weather up in Launceston today. I fully congratulate you on your gutsy, tenacious stance. To think that you spent a full winter 60m up a tree in the coldest regions of Tasmania’s South West is absolutely remarkable. Enjoy the last few snowfalls as they come, brace yourself for the winds, and immerse yourself and draw strength in the re-birth of Spring. I wish you well. great post Steven. Let’s hope the more exposure of the links between the old growth forest destruction in Tas and the fate of tens of thousands Sarawakians brings pressure to bear….I would like to think the world is watching…. and acting…. words fail me except to say greed, greed and more greed.